Tag line: "Stake Your Claim To The Musical Goldmine of '69!" My parents had a fairly large album collection back in the day, and half of it (my mother’s half) was soundtrack recordings (mostly of Broadway shows, but a few were for movies). Among them was a double LP with a dirty green cover and painted images of Conestoga wagons scattered across the front of it, and for some reason, this one always caught my eye. When I was old enough to work the stereo (which was around the age of six), this was the album I’d listen to, staring at the pictures on the inside flap as the music played. I’m sure you’ve guessed by now that it was the soundtrack for 1969’s Paint Your Wagon, so years before I had any idea who Lee Marvin or Clint Eastwood were; before I’d seen a single frame of the film itself, or knew how much money it lost at the box office, I’d already committed many of the movie’s songs to memory. The Gold Rush is in full swing, and the ornery Ben Rumson (Marvin), hoping to strike it rich, kicks off his California experience by saving the life of a man injured in a runaway wagon accident, and then, moments later, discovering gold (which he finds while digging a grave for the man’s brother, who died in the accident). Joined by the guy he saved, who he affectionately calls his “Pardner “ (Eastwood), Ben spends his days mining for gold, and his nights in the makeshift town of No Name City, a frontier community populated by gamblers, drunks, and fellow miners. Though normally a loner, Ben is happy to have “Pardner” around, and the two become fast friends. Their relationship is tested, however, when Ben “purchases” Elizabeth (Jean Seberg) from a Mormon (John Mitchum) who recently rode into town (seems the Mormon had two wives, which was one more than he could handle). Seeing as Elizabeth is the only woman in No Name City, Ben gets pretty jealous whenever anyone looks at her (including Pardner). So, to alleviate the tension, Ben, Mad Jack Duncan (Ray Walston), and a few of the other dregs in No Name City set out to kidnap a stagecoach full of prostitutes on their way to another town. So, The moment these girls take up residence in a new building owned by Rotten Luck Willie (Harve Presnell), the community has its first whorehouse, and before long, other businesses, including saloons and gambling parlors, start popping up, turning No Name City into a bona-fide boom town. But while Ben was out kidnapping the ladies, the unexpected happened: Pardner and Elizabeth fell in love with one another. Not wanting to stand in their way, Ben agrees to step aside, only to learn that Elizabeth still loves him, too, and doesn’t want him to leave. Thus begins a very unusual relationship, with Ben and Pardner living under the same roof and “sharing” Elizabeth. For the three of them, it’s the perfect arrangement, but with respectable people, including a Parson (Alan Dexter) and a family of farmers, arriving in town on a regular basis, it’s anyone’s guess as to how long this little love triangle will continue. Setting aside the nostalgia factor, I genuinely enjoy some of the songs that play throughout Paint Your Wagon, starting with the number that opens up the film, “I’m On My Way”, which deals with the mad dash thousands made to California when gold was discovered there. In addition, “Hand Me Down that Can o’ Beans” is a boisterous bit of fun; and “They Call the Wind Mariah”, sung by Harve Presnell, is a mournful, melancholy tune about loneliness. In a surprising move, both Marvin and Eastwood, a pair of actors not known for their musical prowess, perform their own songs, and while I wouldn’t call either a “good” singer, Marvin’s “Wand’rin Star” manages to stand out from the rest (Eastwood has the better voice, but Marvin, whose Ben Rumson is the film’s most fascinating character, gives his handful of numbers everything he has, making them infinitely more interesting than Clint’s). 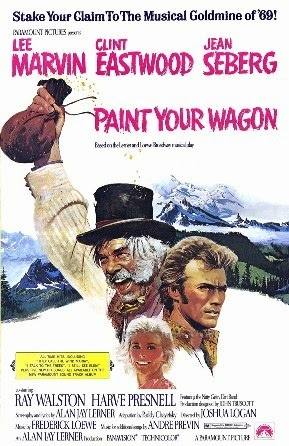 Released at a time when the popularity of the Hollywood musical was dwindling, Paint Your Wagon was further hampered by the fact its production ran way over budget, which made it extremely difficult for the movie to make any money (it had a decent run at the box office, but didn't make enough to recoup its costs). In addition, Paint Your Wagon is far too long; and not all of the music is memorable (the songs performed by Eastwood, including “I Still See Elissa”, are actually boring). And yet, I still had a blast watching it again. In the final scheme of things, Paint Your Wagon may not be art, or even a good movie, but I kinda like it all the same. Oh I love this film. Does that make me old? Clint Eastwood in his youth ahhhh!